Madhumati was one of two Hindi films on which director Ritwik Ghatak worked as a writer. The other film was Musafir, released in 1957 and directed by Hrishikesh Mukherjee. When released in 1958 Madhumati was a huge box office hit and saw the re-teaming of director Bimal Roy and actor Dilip Kumar. Madhumati stands alongside Kamal Amrohi’s gothic noir Mahal in terms of its influence, pioneering and popularising the theme of reincarnation in Hindi cinema. The film is a beguiling one, blending together expressionist imagery, rural landscapes and a haunting ghost story, that eventually builds to an unexpected fatalistic ending (although undercut by a conventional epilogue). 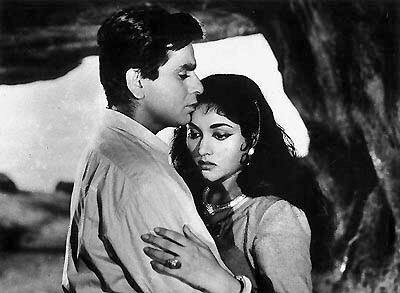 Familiarity with the work of Ritwik Ghatak and his interest in the more indigenous aspects of tribal customs and rural village life (as expressed in both his films and writings) is manifested most directly in the central romance between Anand (Dilip Kumar), a symbol of the middle class, and Madhumati (Vijayantimala), an innocent tribal girl. With music by Salil Choudhury and lyrics by Shailendra, the soundtrack is regarded as one of the creative high points of 1950s Hindi cinema with classics like ‘Toote Huye Khwabon Ne’ (Rafi Saab). I had problems with the running time of Rockstar, a contemporary Hindi film, which ran for three hours (unjustifiably) but considering Madhumati is of a similar length, it is easy determine that unlike Imtiaz Ali, Bimal Roy has formidable control over his material. A superior melodrama. This entry was posted on November 12, 2011 by Omar Ahmed in Bimal Roy, Dilip Kumar, Ghost Story, Indian CInema, Melodrama, Reincarnation.